Thank you for your interest in our Special Reports. Please fill out our short form below in order to access our Special Reports download page. Once you have filled in the required information, you will receive an email containing a password that can be used to download the Special Reports of your choice. Note: Your contact information will not be shared with any other organization. 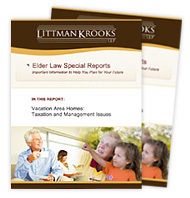 It will be used solely to alert you to issues relating to elder law, estate planning, or veterans’ benefits.